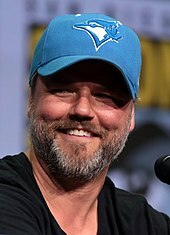 Tyler Sean Labine (born April 29, 1978) is a Canadian actor and comedian. He is best known for starring in the television series Breaker High, Invasion, Reaper and Deadbeat, and the film Tucker & Dale vs Evil. Labine at the 2012 Genie Awards. In 2018, Labine was cast as Dr. Iggy Frome, head of psychiatry, in the NBC medical drama New Amsterdam. Labine was born in Brampton, Ontario, Canada, but grew up in Maple Ridge, British Columbia. He is the brother of actors Kyle Labine and Cameron Labine. He played the role of Dave Groves in Invasion, and Bert "Sock" Wysocki in Reaper, and Dale in the comedy-horror film Tucker & Dale vs Evil. He played the lead character in the 2010 Fox comedy series Sons of Tucson, but the show was cancelled after 4 episodes (the remaining 9 episodes that were shot aired that summer). He also played Jimmy Mortimor Farrell on YTV's Breaker High from 1997 to 1998. In 2011, he co-starred in the CBS comedy Mad Love as Larry Munsch. He starred in the NBC comedy series Animal Practice alongside Justin Kirk and Bobby Lee, which premiered in September 2012. He also starred in the Hulu show Deadbeat. As of 2017, he plays Bergsberg County Sheriff Sherlock Hobbs in the second season of the television show based on Douglas Adams' book, Dirk Gently's Holistic Detective Agency, which aired in October 2017. He is a fan of the Vancouver Canucks ice hockey team. 1991 Street Legal Aaron Wineberg Episode: "Eye of the Beholder"
1992 The Odyssey Eagle Episode: "Checkpoint Eagle"
1993 Madison Bobby Devries Episode: "Last Pick"
1994 Are You Afraid of the Dark? Mark Peterson Episode: "The Tale of the Silent Servant"
1995 The Commish Eddie Episode: "The Johnny Club"
1996 The X-Files Stoner Episodes: "War of the Coprophages", "Quagmire"
1997 Millennium Gavin Episode: "Loin Like a Hunting Flame"
1998 Honey, I Shrunk the Kids: The TV Show Elderbob Episode: "Honey, It's No Fun Being an Illegal Alien"
1999 First Wave Billy Episode: "Melody"
1999 Cold Squad Eddie Episode: "Death, a Love Story"
2000 The Immortal Byron Episode: "Studio D"
2001 Dark Angel Cyril the Biochemist Episode: "Radar Love"
2003 The Twilight Zone Wesley Episode: "Sunrise"
2003 Da Vinci's Inquest Hector Episode: "Iffy Areas Around the Edges"
2005 Into the West Larkin Episode: "Dreams and Schemes"
2006 Saved Kent Fembley Episode: "Code Zero"
2007 Traveler Eddie Hahn Episode: "The Trader"
2014 Royal Pains Dave Episode: "Everybody Loves Ray, Man"
2016 The X-Files Stoner Episode: "Mulder and Scully Meet the Were-Monster"
2017 Kevin (Probably) Saves the World Bert "Sock" Wysocki Episode: "Old Friends"
2018 It's Always Sunny in Philadelphia Shawn Dumont Episode: "The Gang Gets New Wheels"
^ "Sundance 2010: Tyler Labine Talks What Could Have Been in Store for Invasion Fans". Dreadcentral.com. 2010-01-30. Retrieved 2010-07-28. ^ Submitted by Chainsaw on Tue, 11/03/2009 – 2:41am. "Temp Trailer and Sales Art for Tucker and Dale vs. Evil". Dreadcentral.com. Retrieved 2010-07-28. ^ "Trailer Debut: 'Tucker & Dale vs Evil'!". Bloody-disgusting.com. Retrieved 2010-07-28. ^ "Sundance '10: Tucker & Dale vs Evil Bloody Corpse". Bloody-disgusting.com. Retrieved 2010-07-28. ^ "Tyler Labine". Time Out Magazine. 2008-10-02. Retrieved 2018-01-23. ^ Petski, Denise (March 11, 2015). 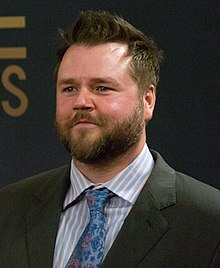 "Tyler Labine To Star In Dan O'Shannon CBS Pilot, Joins 'Michelle Darnell' Feature". Deadline. Retrieved March 16, 2015.